You do not need special brass cleaner to brighten up that old chandelier or brass bell. Just go into your pantry and mix one teaspoon of salt with a half cup of vinegar until the salt dissolves, and then add flour to make into a paste. Apply the past to the brass and let sit for 5-10 minutes. Wipe off with soap and water and buff dry. 1. Spray cleaner directly on the stainless steel. 2. Using a paper towel or microfiber towel, wipe clean in the direction of the grain of the stainless steel. 1. Put vinegar in a spray bottle and spray directly on the stainless steel. 3. Using a separate paper towel or microfiber towel, dip in olive oil and rub in the direction of the grain of the stainless steel. 1. Mix a solution of 3 parts baking soda and 1 part water. Apply paste to grout with fingers (use gloves to avoid irritating your finger tips). 2. Mix a solution of 1 part vinegar and 1 part water in spray bottle. Spray on baking soda paste. You will see it start to "bubble" right away. Wait until bubbling has stopped. 3. Lightly scrub grout lines with an old toothbrush until grout is clean. 4. Clean entire area with clean water. Use a sponge or mop and rinse frequently. Think your light colored carpet is ruined after aunt Jenny got a little loopy at the dinner party and spilled her red wine all over? Think again. Here's how to clean red wine spills from your carpet. 1. Blot spilled wine from carpet with paper towel or clean cloth. 2. Combine 2 cups of warm water, 1 tablespoon of vinegar and 1 tablespoon of dish soap (blue Dawn is best). 3. Soak a clean sponge in the solution and apply directly to the wine stain. 4. Blot liquid with a clean towel and repeat until the stain is gone. Not really a "cleaning tip," but a great idea for the high school grad in your life. Graduation parties are often full of photos, awards and accomplishments of the graduate, as it should be. However, give your guests the opportunity to share a memory or a wish for the grad to cherish after the lights of the party have dimmed. Since this big day goes by so quickly for both the graduate and the parents, this is a really nice take-away to remember this big milestone. And if you happen to need help cleaning up after the big day, My Neighbor's Cleaning Service is at your service to clean the house while you go out to lunch. Keeping your yoga mat clean will insure you are not the "stinky kid" in yoga class. If you do yoga 2-3 times per week, you should clean your mat once a month. Cleaning your yoga mat is relatively easy if you have a bathtub and place to let it dry. Simply fill up your bathtub with warm water and mild dish soap. Let the mat soak for 10 minutes to loosen dirt and bacteria, and wash with a hand towel. Drain the tub and rinse well until all soap residue is gone. Lay flat and press a towel on the mat to soak up excess water. Then let hang dry for 24 hours or until the mat is completely dry. Cleaning your memory foam pillow is a little tricky, but with some care, you can make sure the friend you spend 1/3 of your day with is fresh and odor-free. For spills or stains, gently spot clean with 50/50 vinegar and water with a little dish soap. Then soak up water with a paper towel or clean dry towel. 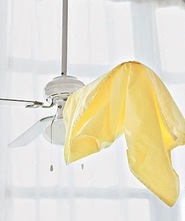 Let totally dry in the sun or in front of a fan before putting the pillow case back on. For general odors, sprinkle baking soda directly on the pillow, let sit for 10 minutes and then vacuum baking soda off the pillow. Repeat on the other side of the pillow. Cleaning your memory foam pillow on occasion will keep your bedtime experience fresh and give you sweet dreams. Sometimes the best way to keep your house clean and picked up is to not let it get too crazy. This tip is especially useful for multi-story houses where "stuff" gets brought down to another level and needs to eventually go back to where it belongs. Keep an attractive looking basket near the stairs where you can put random toys and other objects that will need to go back to their home. Rather than making multiple trips throughout the day, you can save yourself some time and energy by making one trip. Cleaning your bathtub can be one of the least desirable chores you face, and one that is often put off the most. However, My Neighbor's Cleaning Service has a cleaning tip that may make this task a pleasure and require minimal effort. 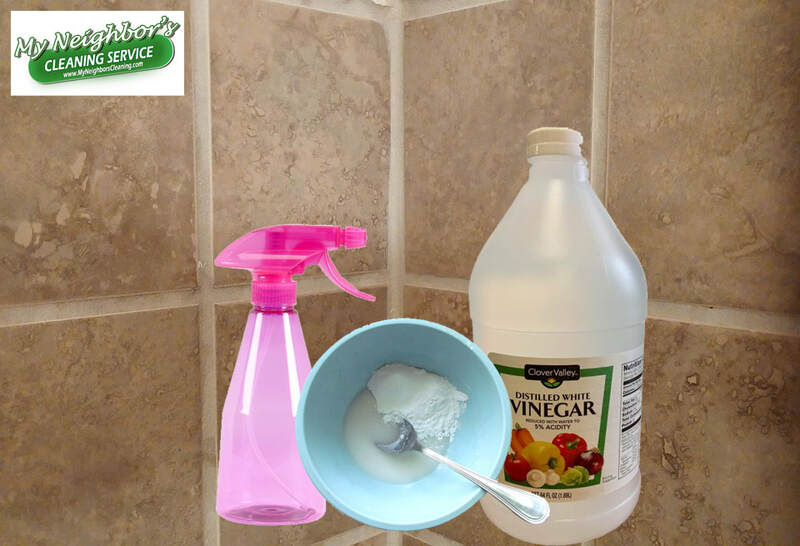 Just mix equal amounts of cleaning vinegar (cleaning vinegar has higher acidity) and blue Dawn dish soap (yes blue) into a good quality spray bottle and shake gently. Then spray the entire tub area with this magical cleaning fluid and let it sit for an hour. Then rinse. It is a highly effective way to clean your tub without chemicals or scrubbing. Your welcome. If you've ever cleaning the dust off a ceiling fan before, you know that if comes off the top of the blades in big clumps of dust. Pretty nasty if one of those dust clumps ends up on your face. Next time you clean your ceiling fan, use an old pillow case to go over the whole blade and wipe the blade off inside the pillow case. All that dust will be contained within the pillow case and not on your head. Then just shake the pillow case out and throw it in the washing machine. Walah! Keep your house clean while cleaning your house! 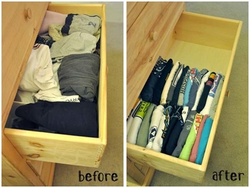 This is less of a cleaning tip and more of an organizational tip that will really help you find the shirt you're looking for lickety-split! The is especially helpful for your children's drawers, as they can get disorganized very quickly. Simply fold your shirts and stack them vertically so you can see which shirt is which. It is a simple change in your routine that will save you lots of time finding the perfect shirt in seconds. Just another time-saving tip from My Neighbor's Cleaning Service. Removing an ink stain from a pen will usually require more than simple soap and water. You also have a better chance of cleaning the stain from the garment if you address the situation as soon as it happens. Just follow these steps; 1) dab some rubbing alcohol onto the stain and let it sit for a few minutes to react to the ink. 2) Blot the ink stain with layers of paper towel to remove the ink stain. This process should save your garment. 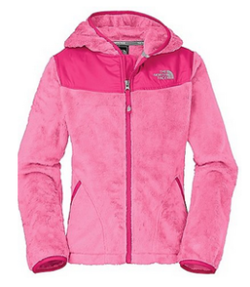 Fleece can loose its softness, which is often caused by detergent build up and drying on a high heat. To revive the softness of your fleece (though don't expect it to be like new), pour 3 cups of white vinegar into the detergent compartment of your washing machine and run on a cold or warm cycle. The vinegar will deep-clean the garment without leaving a residue like detergents and fabric softeners. Dry on low heat or air dry (check instructions on garment), and wash again with no detergent. Only wash fleece with other fleece items only to extend the life of the garment. Those pesky grease spots that slowly start to appear on your stove can be really tough to remove once they've heated a cooled enough times. Soap and water just isn't going to do it. Mix baking soda and hydrogen peroxide in a bowl to make a paste and apply it to the grease spots with a soft scrub sponge. The grease spots will come off surprisingly easy. Cleaning your stove can be a breeze. Blinds are often the last thing we think about cleaning, but seem to be a magnet for dust. Cleaning each individual blind at a time can be tedious work and tends to be avoided. Here's a cleaning tip that will make your life easy and your blinds look like new. Just fill up your bathtub with hot water and vinegar and let the blinds soak for 30 minutes. Set them on a dry towel to dry and then hang them back up. They will look like new and you will have saved time and energy. Just apply a thin layer of your favorite car wax and then wipe it off with a clean, soft rag or a paper towel. This does two things. 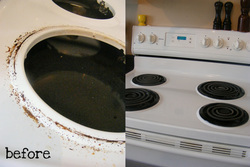 Your stove will look shiny and new and it helps to make cleaning up spills in the future really easy. The foods that normally cause a huge mess on your stove top will simply wipe right up when you have a light layer of wax underneath. Cleaning your house just keeps getting easier and easier. 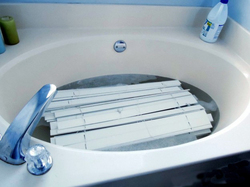 Is your bathroom sink draining slow? My Neighbor's Cleaning Service has a chemical-free solution that works as well as Drano. Drop 4 Alka-Seltzer tablets down the drain, followed by 1 cup distilled vinegar. Let sit for 10 minutes, and then rinse with boiling water. Sponges are a breeding ground for bacteria. My Neighbor's Cleaning Service recommends using dish cloths that are washed after every use to keep your kitchen and house clean and germ-free. However, we know people love their sponges. So to disinfect your sponge, be sure to rinse it, squeeze out the water, and microwave it on high for a minute. When it’s shredded and smelly, replace it. Here's a quick and easy way to keep your house clean throughout the year. The next time you have an empty spray bottle (think glass cleaner), wash it out and fill it with 1/2 white vinegar and 1/2 water. This is the most handy general purpose cleaner you can use to keep your surfaces clean and germ-free. Over time, copper naturally tarnishes. To keep your copper accessories beautiful, be sure to clean them without using harsh chemicals that may damage them. To clean your precious copper pots naturally and chemical-free, mix one tablespoon of salt and one cup of white vinegar and rub onto the copper with a soft cloth and rinse.